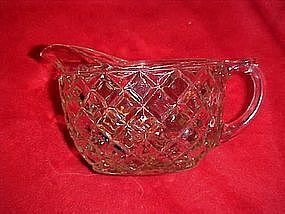 This creamer made by Hocking glass from 1938 -1944. Known as waterford or Waffle pattern. Crystal clear and in perfect condition. Measures 2 1/2" tall plus lip, oval shape.